In January this year, Diana of Elephant’s Eye invited us to write a plant portrait each month. 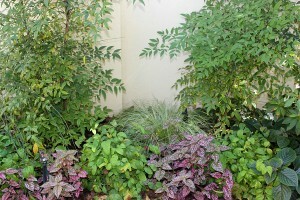 “I challenge you, in 2012, each month choose a plant. Archived pictures of flowers, berries, autumn leaves, wildlife endorsing your choice. Start fresh - what will be your signature plant?” In January I profiled Carex evergold and in February I raved about the Pittosporum eugenioides ‘Variegata’. In March it was Dietes grandiflora and in May it was Clivia that was featured. Then in June I was enamoured with my Camellias that were flowering profusely and then … well winter hit us, life got in the way of regular gardening and blogging and so I’ve missed a few months. So today I am playing “catch up” and featuring three of my favourite plants. Truth be told, I find it hard to wax lyrical for paragraphs on end about some of my choices, so a combined post is perhaps not such a bad idea right now. These next three are all fairly common plants. Common yes, but not in a negative way. Popular is probably a better way to describe them. I’ve also found that being quite new to gardening its been a lot of traial and error that lead me back to these dependable plants and one of the main reasons I feel I could not garden without them. First of all, I simply love Lavender. I mean really, really love it! My garden with all its shade is really not an ideal environment for Lavender, but I have a narrow bed against a wall, bordering our pool that gets enough sun to allow Lavender to thrive. And thrive it really does. And another absolute favourite that I paired with Lavender is Gaura lindheimeri. I absolutely love the combination of the two and have added plenty of new Gaura this year in the hope of an even more magical display this summer. Both bloom together in this bed for months on end and give me tremendous pleasure. Both get a huge thumbs up from me as plants I will plant in any garden I own … even in pots on a balcony if that is all I have. 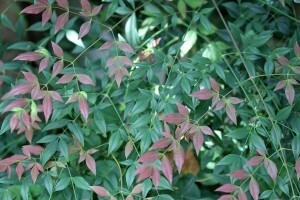 And now, I hope I don’t get shot down in flames over this choice, my next one is Nandina domestica. I’ve read very negative reports about Nandinas, I believe they are considered undesirable in some parts of the world, but here in my shaded Cape Town garden, things would be very bare and dull without the backdrop of green provided by evergreen and ever-pretty Nandinas tucked into many places where not much else would provide such a lovely, easy to maintain background to all the other plants in my garden. And I am delighted every season by the changes in these lovely shrubs, especially when they are adorned with massive bunches of bright red berries which some of my birds seem to love. How stunning is the foliage on this? So there they are. My numbers six (Lavender), seven (Gaura) and eight (Nandina). Not the most original choices, I know, but much loved here in my garden. Christina you have 2 of my favs here..I also love lavender and white guara and what a pairing….nandina is a no, no here but it has its place somewhere in the world and it is lovely so a perfect choice. Three beautiful choices, Christine! 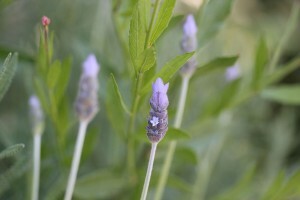 The Guara/Lavendar combination certainly is lovely! I’ll have to remember that! Your garden always looks so tidy and bright! Gorgeous plants! 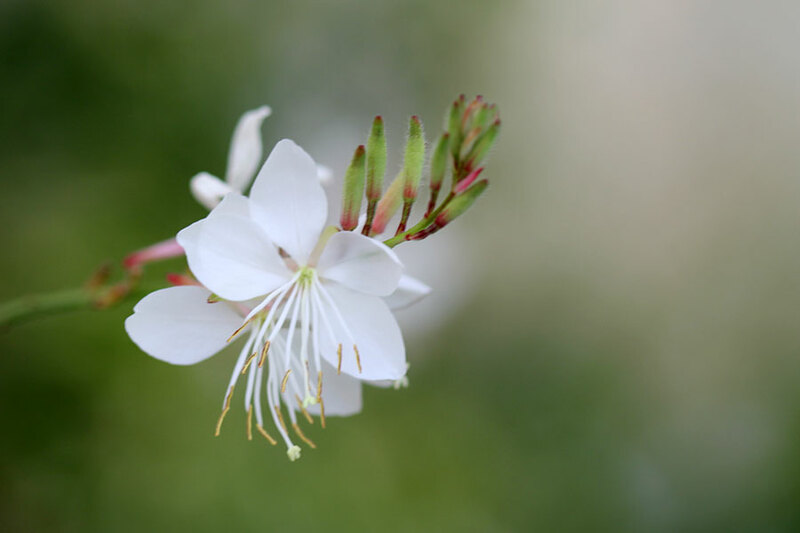 I have Gaura, and I absolutely love it. It’s so airy and delicate. That’s a great combination with the lavender! 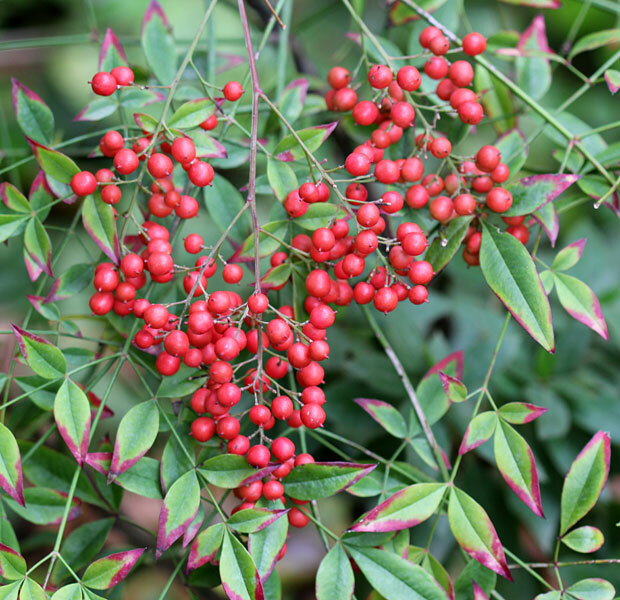 Nandina with berries are invasive here in the US, but you can buy non-fruiting cultivars now that still have the beautiful fall/winter foilage without the invasiveness. 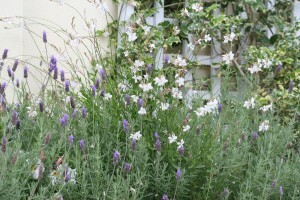 The lavender and the gaura together is stunning, I’ve never seen that combo before. I can grow the gaura but the lavenders don’t make it here, unfortunately. I have tried, they look great until May, then instant dead. 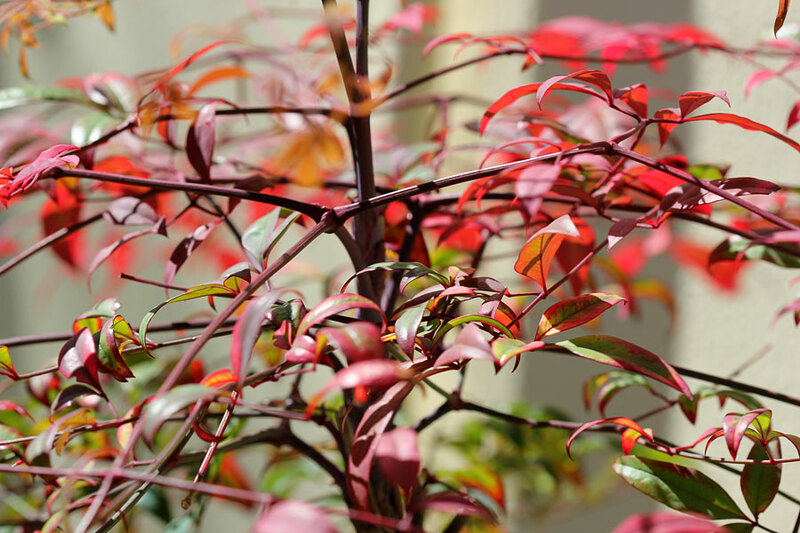 Tried and tested, the plants that say they are happy to grow with you – absolutely. The lavender and the Nandina are in vases in the house as I write. Gaura I don’t have, but my white pelargonium is giving me bunches of flowers to pick. Took 2 bunches to Cape Town for my sister and my mother – brown beach sage, lavender, shocking pink, and white, pelargoniums, yellow Euryops – a bunch of spring garden colour! 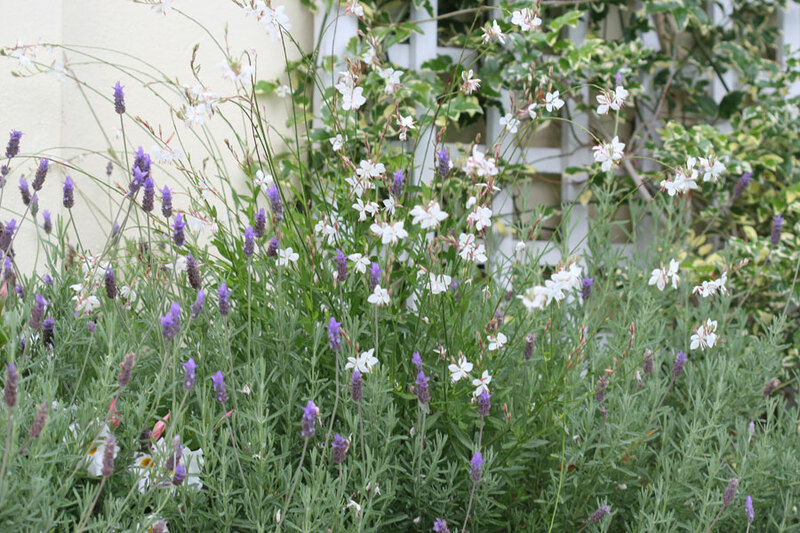 Beautiful lavender and gaura—-wish I could grow them. 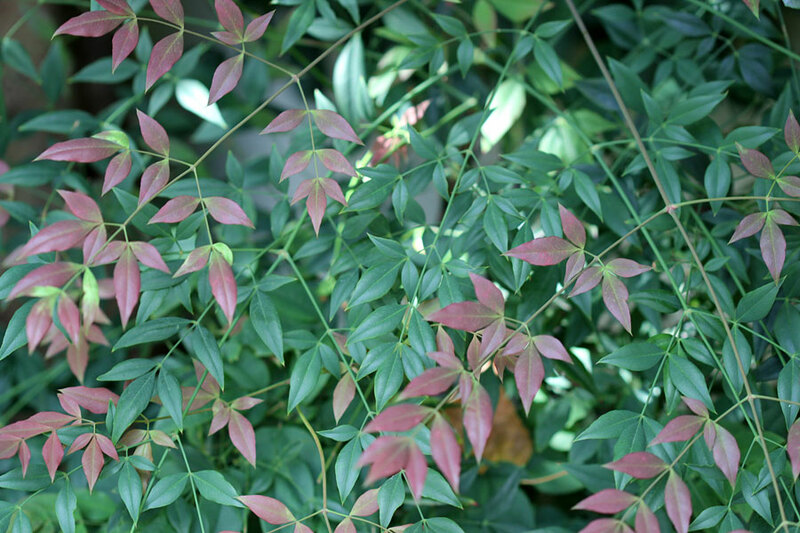 Nandina is also quite gorgeous. As long as it isn’t invasive in South Africa, I don’t see why you shouldn’t grow it or profile it. 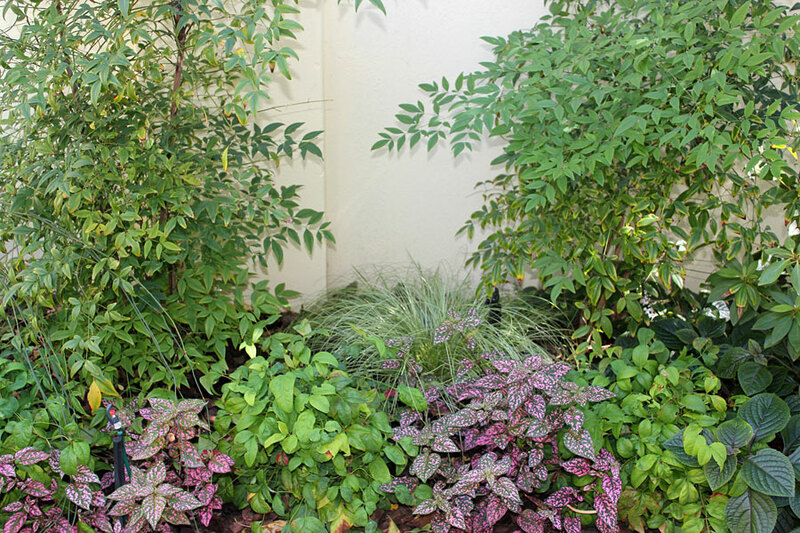 It is invasive in the US, but gardeners need to check invasiveness whenever they plant a new plant. 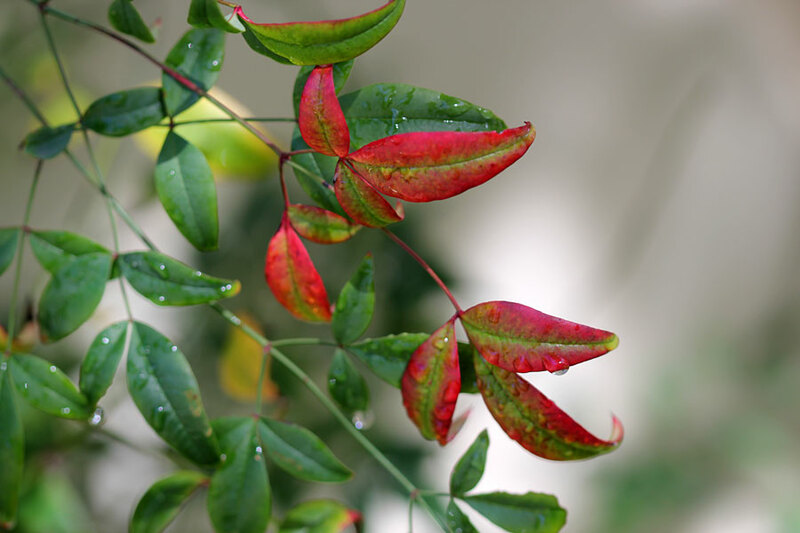 Nandina is “eh” for me though. It’s quite common here, so maybe that’s it. It could also be because most people prune theirs, and I’m not a big fan of formal pruning. Hi Alan – I agree with you about the formal pruning – I’m not a fan. To me the Nandinas are lovely left to their own devices. All I ever do is cut back when they encroach on the Camellias’ space. 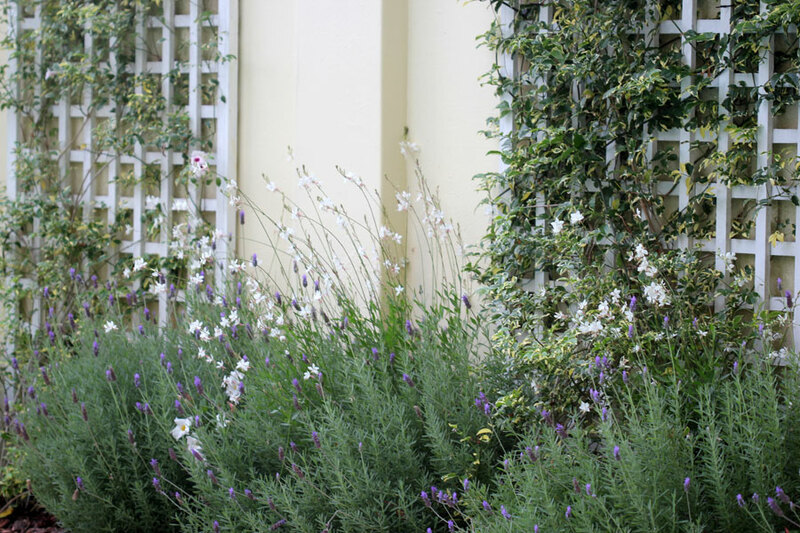 Good luck with your Gaura – mine looked really miserable during winter – ugly even, but a bit of a cut back in early spring and they are again looking gorgeous. Still small, but great! Lovely choices Christine. I love the Guara varieties in my gardens, the tiny blossoms seem to float above the other blooms giving an illusion of hovering butterflies. I agree, thats what I too love about them. So pretty. 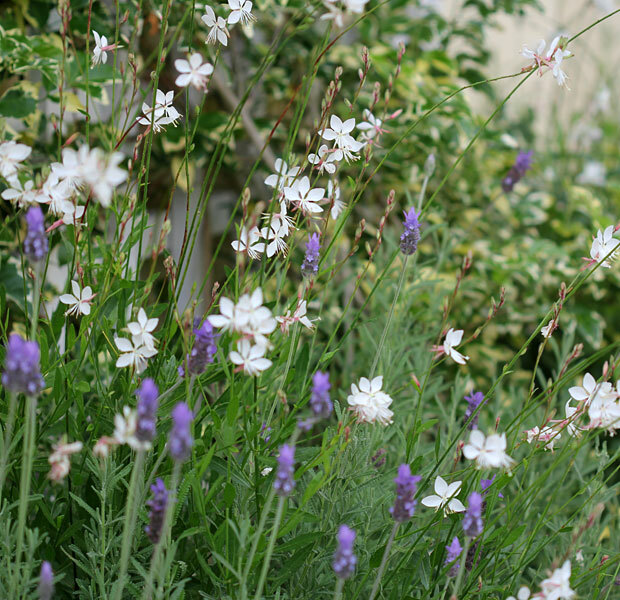 The lavender paired with the gaura is just perfect. Lovely. 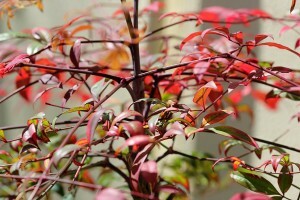 And I have just started adding nandinas to my garden. Like you, all I’ve ever heard was rants against this plant, but I am enjoying the ones I have put in. There’s something wonderful about dependable! I agree Holley. Very aptly described by Christina as “Supporting cast”, I love how they blend into the background, the perfect background plants. 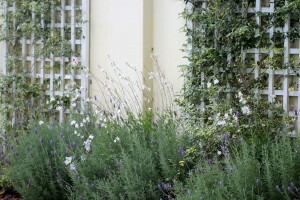 Chris, I love your combination of Lavender and Gaura. Sometimes simple plants together give you the special star quality you need. These are two favourites of mine too. That is exactly the phrase I was looking for yesterday – “Supporting Cast”. That’s how I feel about these plants – they support the rest. Without these, the others would not show up as well. I am going to look for your supporting cast post. I feel there must be others I can incorporate.